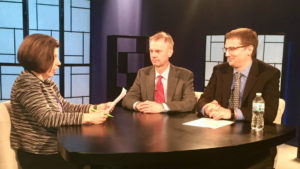 Tax Department Principal, Peter Zich, and Tax Manager, Andrew Schmidt, recently sat down with Liz Spencer, host of Naperville Community Television’s (NCTV17) Business Connections to discuss the 2018 Tax Cuts & Jobs Act and how it is affecting local businesses and individuals. NCTV17 delivers hyper-local television coverage of the people, places and issues affecting Naperville residents. They regularly produce talk shows such as Business Connections to discuss business, careers, nonprofits, and lifestyle issues. To watch the video, please click HERE. Or, to learn how this tax reform measure affects you, contact a Dugan & Lopatka professional at info@duganlopatka.com or (630) 665-4440.